I said in my June favourites post that Lush is not my favourite brand, I agree with their stance on animal cruelty but certain other things have put me off them the past few years. 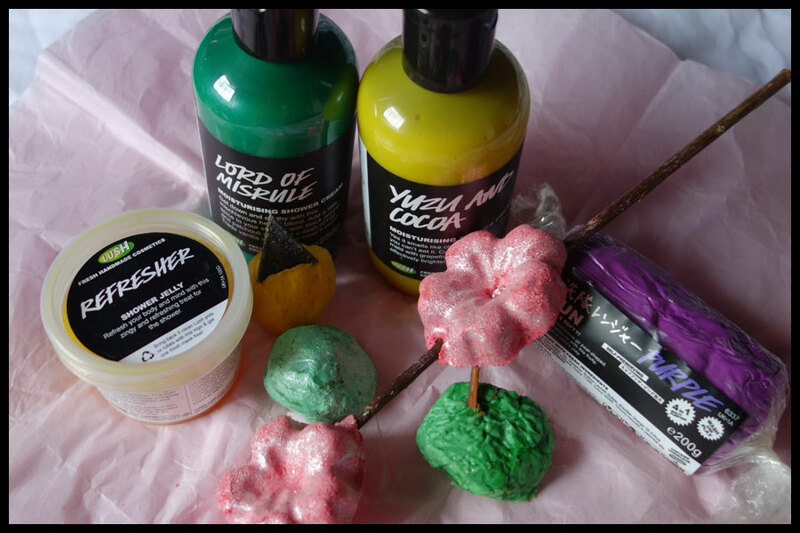 I have, however been watching all the information on the newest products and got quite excited about them though was disappointed that I couldn’t get to the new Lush store in Oxford Street to try them. On the Lush forum a lovely member said she was going to go there and asked if anyone wanted to buy anything so I ended up getting some bits that she kindly sent to me. I did also get some samples but at the moment I am unable to actually open the pots so can’t really comment on them, when I do get them open I might do a mini review thing then. I may have also been looking eBay and put some bids on things that weren’t really over what you’d pay for them with postage and didn’t think I’d win any, in the end I won three of the lots which was a nice surprise and I got combined postage for them so this post is sort of a combination of the two recent purchases in one. This post is just a first impressions, if there are any of these products you want me to do a full review of first then ask and I’ll try them before the others. Unfortunately none of these products are available anywhere outside of the Lush store in Oxford Street unless they’re sold on their kitchen page of the website. I have, however, read hints of a July release so it may not be too long before the rest are available. I do want to try the new comforter shower cream and compare it to my comforter shower gel as that’s a favourite of mine. 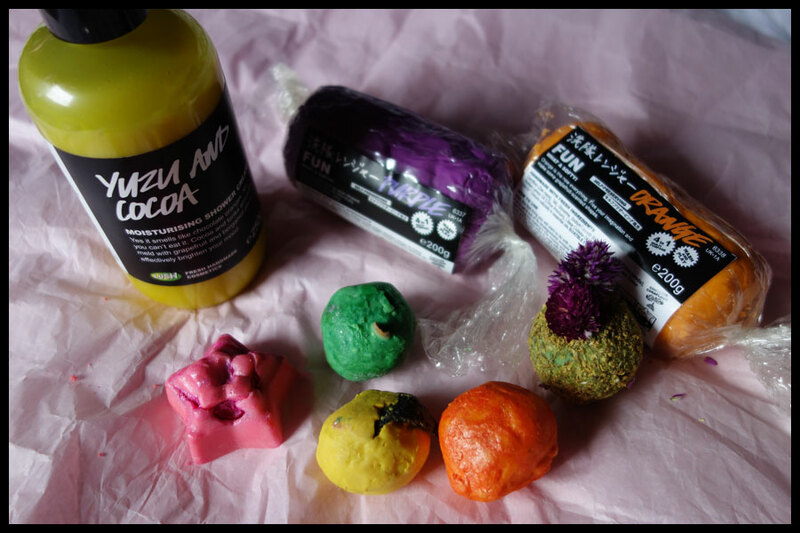 The eBay items I won were five of the bath oils; Shark Infested Custard, Johnny Appleseed, Orange Blossom, Razzle Dazzle and Furze, the Yuzu and Cocoa shower cream and two of the FUN bars, the purple and orange. The products the lovely forumite got for me were the Yuzu and Cocoa shower cream (I forgot it was on my list and didn’t expect to win the eBay lot, oops), Lord of Misrule shower cream, Johnny Appleseed bath oil, Shark Infested Custard, Lime Pastille bath oil, purple FUN and the Refresher shower jelly. I think of the new products the bath oils were the ones I was most looking forward to, I love bath oils and I’m quite impressed with these. 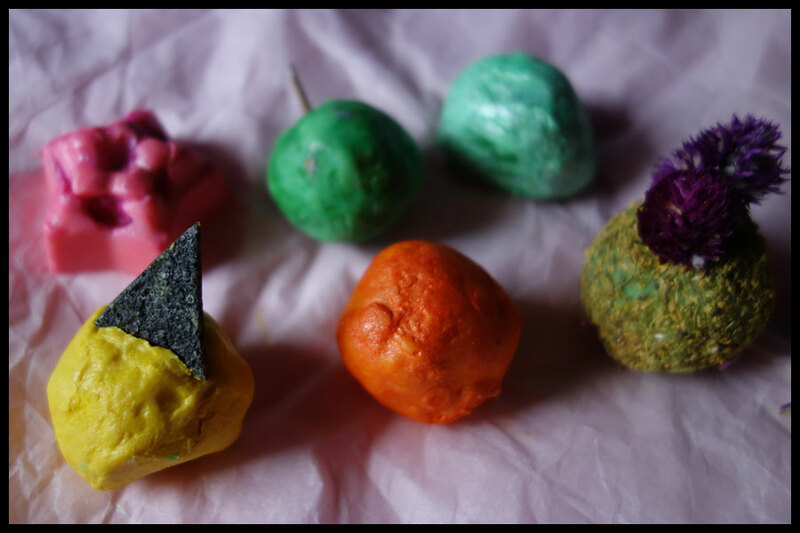 I have had a bath with the one of them and used a half and it was enough for me, if these are going to last that well for all of them they come to £1 a bath as they’re £2 each so for Lush these are pretty good value for money. Shark Infested Custard – A bit too subtle, have to really smell this up close so hoping it’s stronger in use. Smells just like vanilla custard. I do like the little shark fin sticking out of this. I have a bit of a weakness for shower gels, I always get them from any company as they’re so versatile and can last ages if you don’t need much. I like some of the Lush shower gels from past forum parties so was intrigued by this new form of shower product that I think is meant to be more moisturising. As well as the new shower creams they’ve brought out a new larger size of the bottle, I think all of the current shower products are now available as 1kg bottles as well in the Oxford Street store. I’m not sure I’d want to carry a 1kg bottle around in their paper bags so if you want one I’d suggest taking another bag to use, also not sure how easy it would be to use given the size of 500g bottles but I’ll have a look at them when they’re in other stores. The prices for the different sizes of shower gel are: 100g £4.75, 250g £9.50, 500g £15.95 and the new 1kg is £27.50. I went with the 250g as it lasts quite a while for me and means I don’t have an overly large stash, I already have too many shower gels. Yuzu and Cocoa – Just like the bubbleroon, a cocoa, almost chocolatey, orange scent that isn’t too sweet. I’m not often a fan of chocolate in washing products but I do like this, it’s not too chocolatey for me. 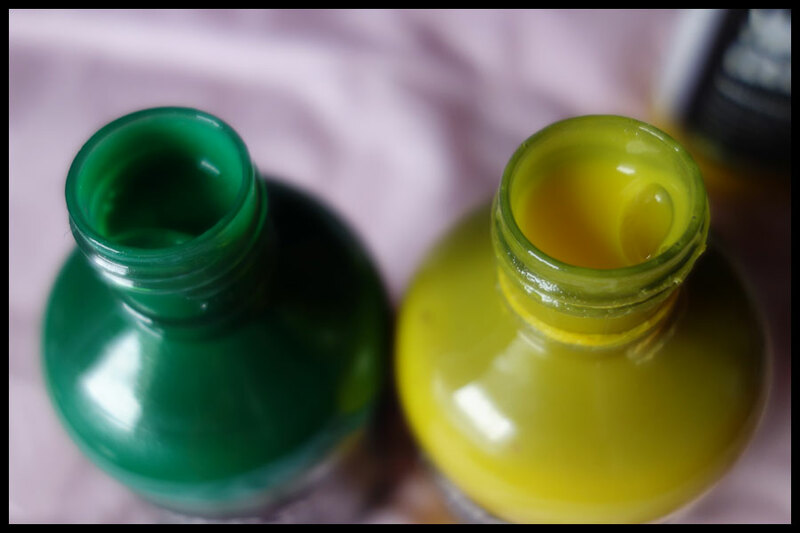 I will say that I have two bottles and they are so different consistency wise. The first I got from eBay is almost as thin as water, it did make me worry a bit about the other scents in the product type, though the other bottle is much thicker and closer to the creamier shower gels Lush do. 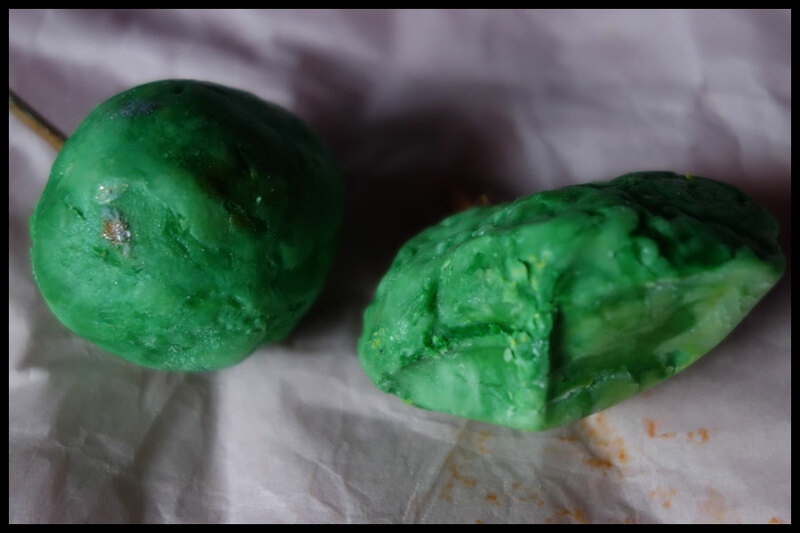 Lord of Misrule – When this scent first came out I was a bit wary, I am not normally a fan of peppery scents, but then I got one of the bath bombs in a gift the first year they did it and I loved it. It’s definitely a unisex scent and has an earthy smell with a hint of pepper that makes it warmer. If anyone has smelled the Paul Smith women’s perfume Extreme then this really reminds me of that. Also one of the thicker consistency bottles like my second Yuzu. The Cherry Blossom reusable bubble bar looked too good to not get, I love the design and the smell is like their discontinued Cherry Tree Lane soap and Sakura bath bomb. Can’t wait to try it and hope it’s one of the successful reusable ones that last six or seven baths rather than the unsuccessful ones that turn to goo in the first bath. This costs £5.95 which is a good price if you get six or seven baths out of it, if you barely get one then it’s not. I love their shower jellies, I know they seem to be one of those products that gets either a love it or hate it reaction and I know a lot of people buy them to turn them into shower gels but seeing a lemon scented jelly I had to try it. The Refresher jelly is just like the refresher chews I used to get when I was little, I think they still do them, and it was one of those things where you smell a product and it just takes you back. I do like the scent, a great wake you up scent and true lemon sweets with a hint of sherbert fizz in there somehow. The jellies cost £3.50 for the 100g smaller pots and the larger 240g pots cost £6.95. FUN bars are another thing that gets a love or hate response, the fact that they melt and turn to goo and have been known to stain things really doesn’t help them. I haven’t had that problem but any FUN bars will be kept in a tuppawear container just in case, then the worst they can do it melt into each other. I don’t find them drying and they work well for me to wash, I haven’t had any success with them as bubble baths though. These fun bars will cost the same as the current ones, so £5 each for 100g. Purple FUN – This smells exactly like those purple blackcurranty ones you get in dolly mix, which is great as I love that smell. 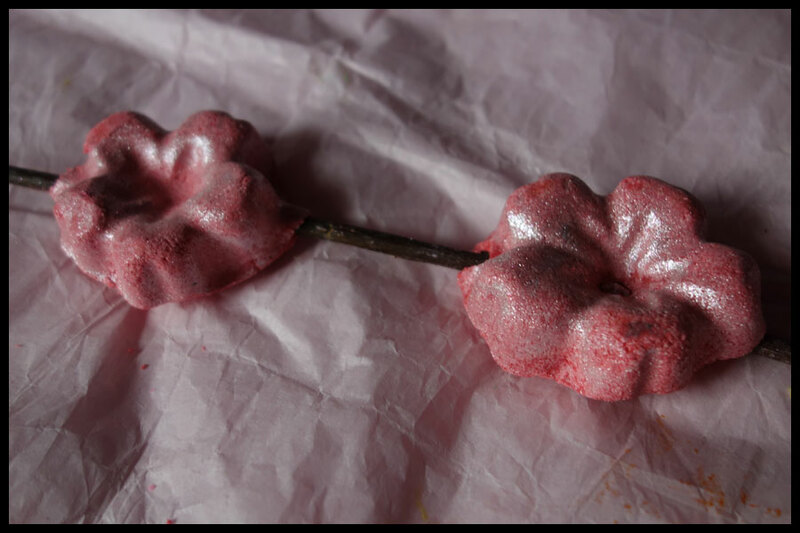 They’re definitely more sweet than currant which will be disappointing for people expecting something more like the comforter, it’s probably like mixing the comforter and snow fairy, which used to be a combination I loved in the bath. Orange FUN – I can’t quite put my finger on this scent as it’s pretty weak. I think it’s just like the Calacas/Day of the Dead products they’ve brought out a few times but I’ll have to see if I can get a better smell when I use it. If it is I’ll be happy, I just wish it smelled more. Of the new products the ones for me that are definitely worth their money are the bath oils. The FUN bars do last well and at £5 each if you like the product they’re good value but they are definitely something I’d ask for a sample of first if you haven’t tried FUN first, they’re normally happy to do small slices online. I’m always happy with their jellies, I think they’re the one kind of product from Lush I have never been disappointed with in their scent strength and how well they work, it’s just been whether I like the smell or not which is not their fault. Overall I am happy with what I have. I’m not sure how many of them I would repurchase when they’re available nationwide but I’m happy I’ll get to try them and do like a good excuse for a relaxing bath. 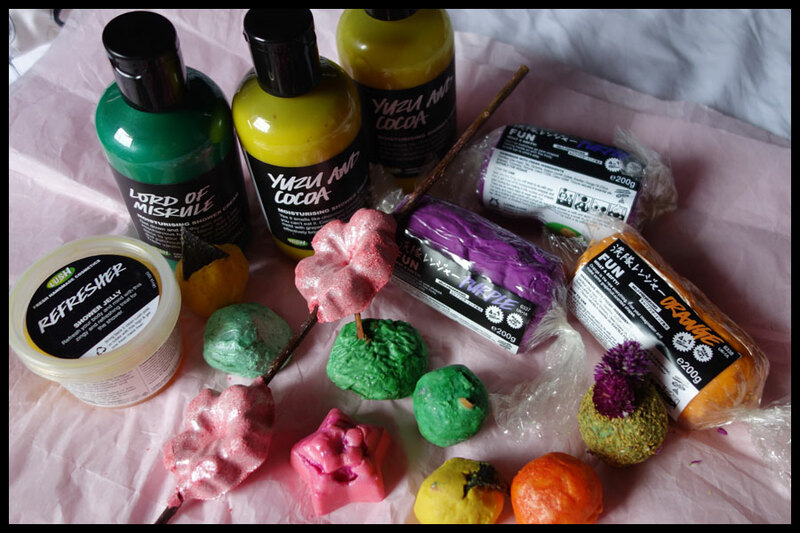 It hasn’t made me love Lush again like I did and I think I’ll probably try the products I want to and go back to not buying from them apart from the odd bit here and there though I might find a new favourite amongst them, I have a feeling Refresher might be one. To be honest and it seems like, if these products are anything to go by, the product quality isn’t really improving consistency wise or with strength of scent. 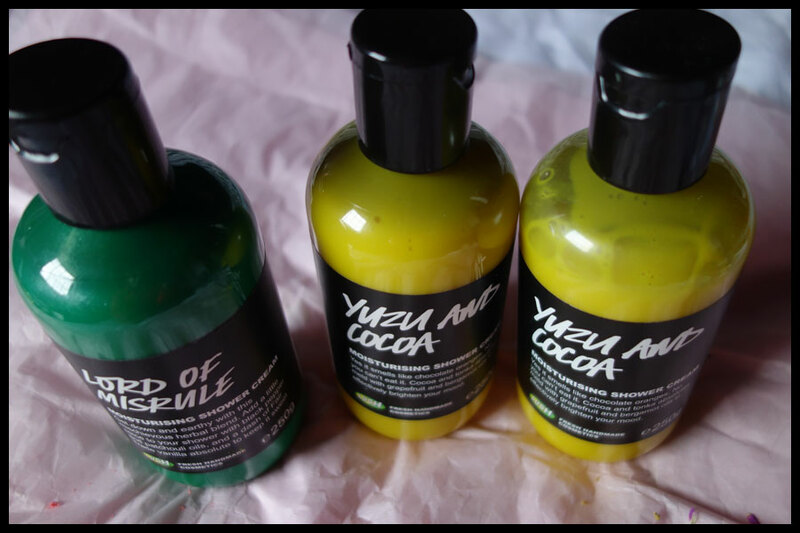 If I only had the one Yuzu and Cocoa and though that was how their products are I probably wouldn’t buy any of the other shower creams but I’m glad they aren’t all that runny. Whenever these are released online or in more stores I will probably order some more bits, I’m a sucker for their limited editions and new products, and I’ll post some reviews when I’ve given these a fair try, and managed to open the lids of the samples. Have any of you tried the new products from Oxford Street? Did you find any of the products better or worse than I have on first impression? I haven’t actually tried any beyond the half a melt and the shower cream but I am looking forward to seeing how different they are when you actually use them.